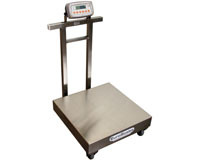 EuroScales range of mobile platform scales for goods receiving and shipping, manufacturing and packaging are available as mild steel for standard applications or stainless steel versions for wet or pharmaceutical applications. They are designed for capacities from 15 – 1000 kg A wide range of options include printers, USB memory stick or Wireless data transfer. Euroscales offer a comprehensive range of high quality industrial mobile platform scales to meet the needs of the majority of users where static scales just arent versitile enough.